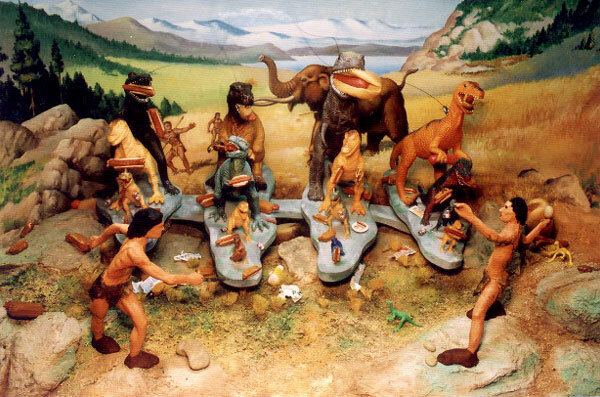 "The World According to Gerb"
Does anyone really know what went on in the prehistoric days? The extinction of the dinosaurs, Noah's Ark, good old Medusa with that snaky, snaky hair? To answer profound questions about the past, one has to think hard and collect all possible evidence. 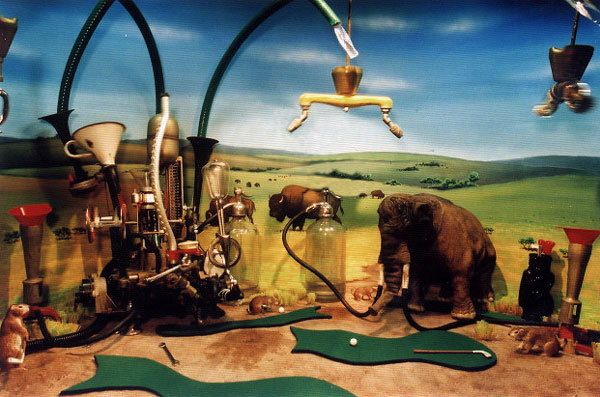 Professor Gerberich has taken a fresh approach: He's built small dioramas to test and demonstrate his theories on the Carnivores, Herbivores, and Metalphores. 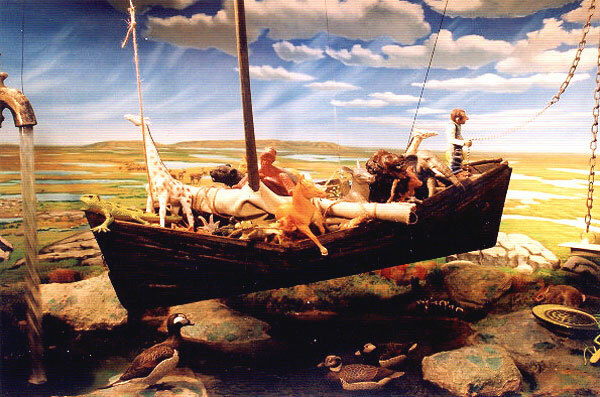 In the 1950s and 1960s, the Stamford Museum & Nature Center displayed a number of dioramas exploring natural science themes. 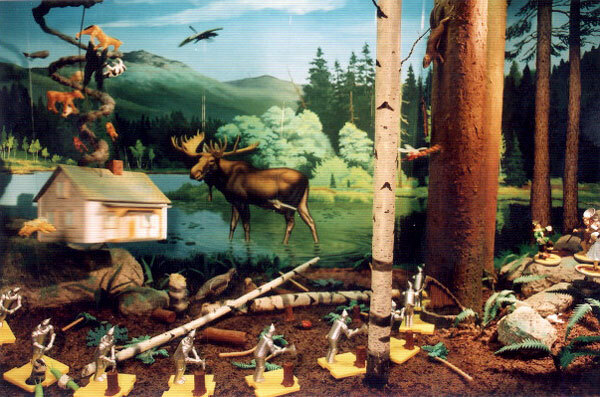 As the Museum evolved, the dioramas were removed from public display and stored in the basement. 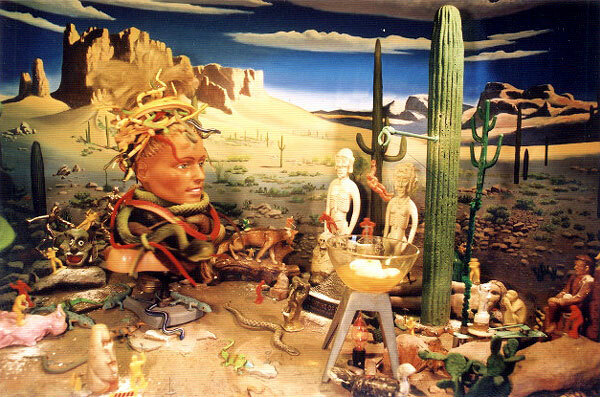 Gerberich rediscovered the dioramas a few years ago and gave them new life. Leaving much of the original scenery intact, he has created new scenarios that come alive at the push of a button. 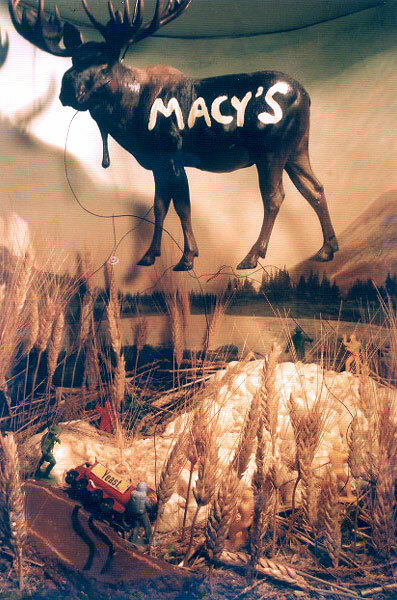 One hot August day, a lonely moose foundered on wheat dumped from an overturned truck and inhaled yeast from the spill. 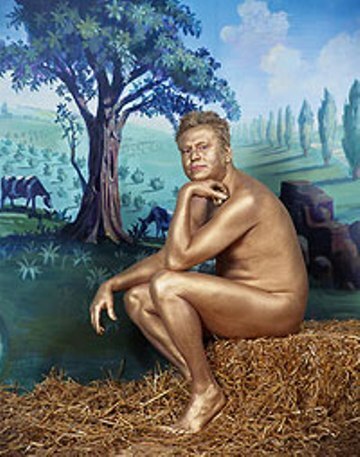 Bloated and full, he began to rise, becoming the original Macy's Day Parade Float. Medusa, an avid bowler, sent a message to the workers asking for a ride to her bowling league. The messenger- hard of hearing from running all those stone-carving power tools- got the task all mixed up and returned to her with a hot bowl of Menudo. Medusa, a devout vegan, had the former employee dipped and dunked in the boiling Menudo soup. Old McGerberich's Farm Enter this life-sized diorama and a pig squeals. 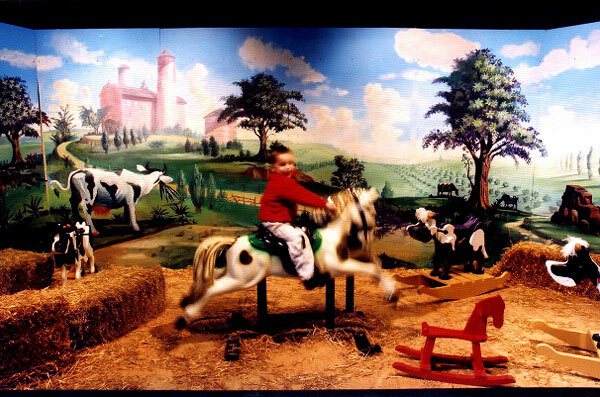 Kids are invited to ride Polly the automated Palomino or rock on with Bessy the cow. Adults can sit on a real bale of straw, survey the back forty, and ponder the weather, while chewing on an alfalfa stem. Painting by Mark Strathy 8 by 24 feet, 2002. Becoming social and somewhat civil, the T.Rex found itself a spectator at early Man's baseball games. In the bleachers, these Carnivores found themselves addicted to hot dogs. Unfortunately, the Rolaids plant went on strike, causing T.Rex to perish from heartburn. After getting such a bad rap in the movie "Caddy Shack," the gophers--brilliant subterranean engineers-- formed a union and built their own rain-collection and watering system. This goph-course aqueduct actually improves the environment, without shrinking Earth's water supply. In the towns of Sodom and Gomorra, the landlord refused to fix the leaky faucet after an all-night party. God, disgusted with the people and the landlord, flooded the land. He appointed the building Super, Noah, to pull the plug and drain the World after 40 days and 40 nights. Hollywood decided to cut studio costs and clear the forest for a new colorized film. Dozens of tin automatons were built to cut down the trees, leaving nothing but stumps. The yellow brick road exists to this day, providing access to the suburban sprawl. 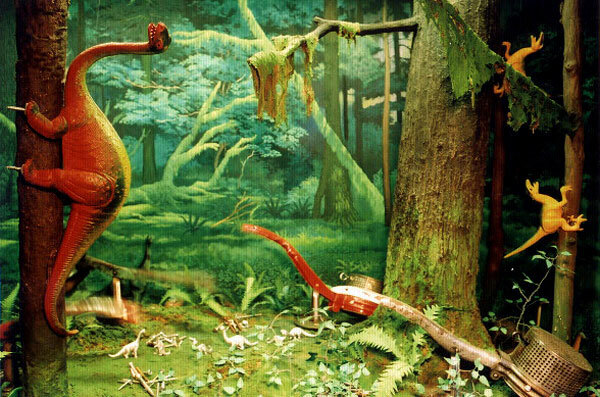 Somewhere near Pittsburgh evolved the most bizarre creatures on Earth, the Metalphores. With a diet of nuts and bolts, these creatures were mean and nasty, causing the gentle Brontosaurus to attach metal screws to their feet and to climb to safety.